Direct 2 Brain, along with Ercole Cosmi, will be in Venice with the color correction of several projects. 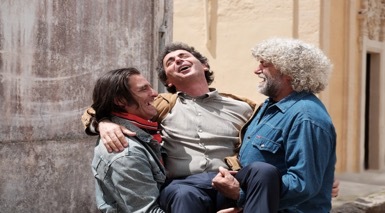 “la vita in Comune”, selected in the “Horizons” section, is Edoardo Winspeare’s new film produced by Saietta Film (Edoardo Winspeare, Gustavo Caputo, Alessandro Contessa) and Rai Cinema. It is ambitious and a special kind of fairy tale. The film is written by Winspeare himself and Alessandro Valenti, and photography is by Giorgio Giannoccaro. “Lievito Madre” will be in Venice in the special screenings, and it is a docufilm directed by Concita De Gregorio and Esmeralda Calabria that collects stories of celebrities of the twentieth century. Finally “Gomorra VR”, which brings us into the Sky-cult cult series thanks to the VR technology that allows viewers to access the multimedia content on the set in an innovative way. This 2017 new project will approach the laguna for the Film Festival at a special event dedicated to this tv project and Direct2Brain is proud to have taken part in the project. In the past, Direct2Brain has been working on VR technology projects and has been enthusiastic about Post Production and color correction accepting Gomorra VR new challenge with enthusiasm. The projects were carried ont by the Colorist Ercole Cosmi who’s working with Direct2Brain in the new Cinema Room in the Rome office, set up with Scratch for Color Correctiom, Barco Projector and Harper Microforated Cinema Screen.